BJP under Modi has created an environment of political hostility. Victors are normally expected to be graceful in their moment of triumph. But we live in abnormal times, and the BJP is redefining moral rectitude in political behaviour. Within days of BJP’s humongous win in the Tripura state elections, their incensed mob of frenzied supporters vandalised the statue of the formidable Russian leader Lenin, in the southern town of Belonia. Lenin has been an ideological inspiration for the CPI(M) that governed the state for 25 years. At the time of writing, another statue of Lenin in the state has been desecrated. A senior leader of the Sangh Parivar, Ram Madhav, posted a tweet that was a formal imprimatur of the violent manifestations underway. As public outrage escalated, he promptly deleted the tweet, but the subtle innuendo to the triumphant mobs had already been done through that transitory political messaging. 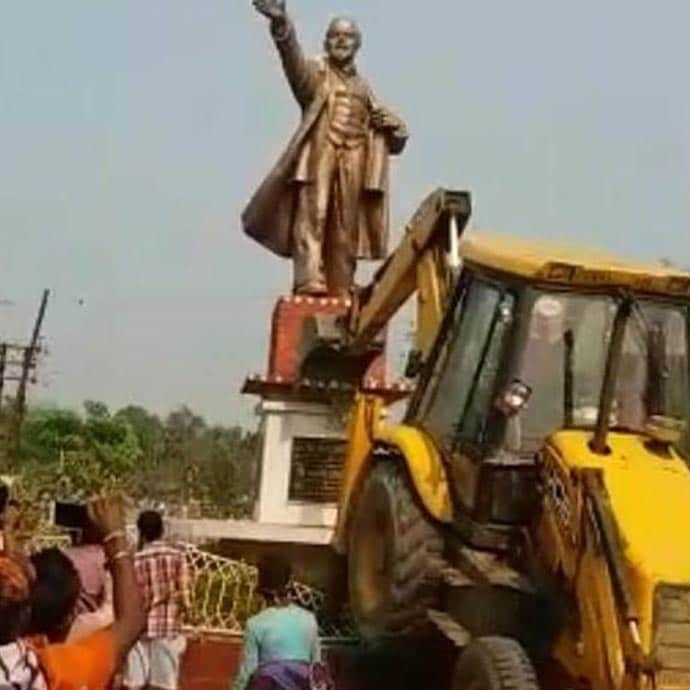 Lenin’s statue in Tripura’s Belonia was brought down by BJP supporters. This is how the BJP has over the past four years mastered the art of running with the hare and hunting with the hounds. Now, Tripura has Tathagata Roy as the governor, a constitutional position, deemed dispassionate and overtly apolitical. But Roy functions more as an agent provocateur of the RSS family and thus as an irrepressible right-wing fundamentalist. Roy gave a carte blanche to the hooligans on parade through a tweet, but those who have followed his spasmodic outbursts on social media will not be surprised at his venomous outpourings. 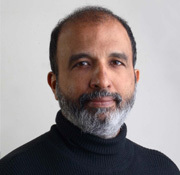 Roy clearly views secularism as an exasperating intrusion into the Indian Constitution, and his anti-Muslim tirades are a constant reminder of his Hindutva propensities. Of course, they could, but how can the gubernatorial chief implicitly endorse a bulldozer razing down the statue of the communist icon (incidentally, the Left coalition still had 45 per cent of public vote-share even amid the ignominious rout and was elected consecutively for a 25-year-period), and to add insult to injury, play football with Vladimir’s head? Why are the instruments of state machinery responsible for law and order blissfully oblivious to the mayhem? Several other property assets of the defeated CPM were ransacked. Why was such ugly berserk conduct being pardoned? And more importantly, how can India buy Prime Minister Narendra Modi’s sanctimonious expression of condemnation of the Tripura violence, when he has allowed Roy unrestrained freedom to increase the communal temperature? The governor has disdainfully dismissed the Indian Constitution itself, and that is okay? Negativity spreads like a Californian wildfire, incontinent, unrelenting, especially when supposedly responsible public figures gleefully add oil to troubled waters. H Raja, a BJP leader from Tamil Nadu, not to be outdone in this age of competitive communalism and caste-politics, then threatened that “Periyar” EV Ramasamy, the founder of the Dravidian movement, would be the next target. Before long, Babasaheb Ambedkar’s statue had been defiled in Uttar Pradesh. As predicted, soon Mahatma Gandhi’s monument was made bereft of his famous spectacles in Kerala. The ugly statue war is reaching diabolical proportions, and it is escalating beyond ideological schisms of Left versus Right to muscular demonstrations of crude prowess. Indian democracy is being turned upside down. The winners here behave like graceless conquerors, their vulgar vanity a shameful reflection of their visceral animus towards political opponents. It stands contrarian to our once-cherished values of tolerance and goodness. Something has changed dramatically in the past four years. And Modi has a lot to do with it. Elections are certainly a winner-takes-all brutal contest, but the BJP under Modi has created an environment of political hostility, opponents are not seen as ideological alternatives for the people, but as dangerous enemies that must be comprehensively destroyed. Modi’s call for Congress-mukt Bharat (and now Communist-mukt Bharat) is symptomatic of his inner conviction; don’t just defeat the enemy, exterminate them, destroy their very vestiges. It reveals a pernicious unalloyed fascist streak where co-existence with differing ideologies is seen as superfluous. For the Sangh Parivar, thus, distracting symbolism is sacrilegious and hence statues become visible, soft targets. Lenin, Ambedkar and Gandhi may be the current victims, but no one is above vilification. Don’t forget Babri Masjid was brought down in 1992 in an orchestrated, pre-planned conspiracy, where BJP’s senior-most leaders watched the annihilation of the mosque from vantage points. India witnessed its worst social conflagration since Partition. India has never been the same since. But a larger, more sinister campaign has already begun, reportedly, under Modi’s diktat. India’s age-old history is being rewritten to adapt to Hindutva sensibilities. The ulterior objective is to create concrete statues in impressionable young minds that make them believe in things that never happened, and look at events and people through jaundiced eyes that suit the RSS worldview. That is the ultimate goal of saffronisation. It starts with schoolchildren and text books. One can file an FIR against a marauding vandal caught on camera, but when the human mind itself is psychologically brainwashed and malevolently molded in an insidious campaign of lies, what do you do? Because for that violent indoctrination that preaches “othering”, there is no eyewitness. No camera. No sting operation. And thus no indictment. More than the physical structures, it is the unseen, imperceptible ghettoisation of the mind that we should worry about.